When trance music exploded into the club/disco scene, practically everyone just went wild and crazy. They just danced away. I cannot say the same when it comes of the topic of trance in terms of flipping rabbits around so that their belly face up. 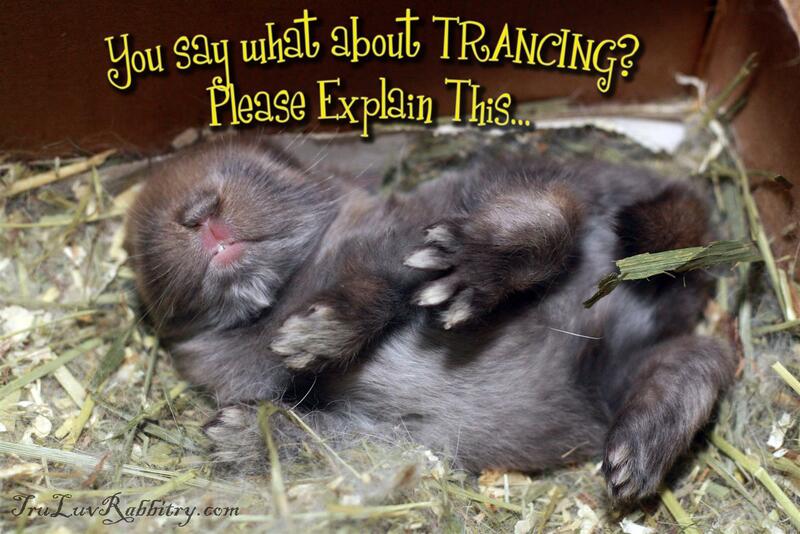 There are some groups out there advocating that trance is harmful to rabbits. I for one uses the trance technique whenever I need to groom the fur on my rabbits’ belly or when I need to clip their nails. In a trance position, the rabbits stay completely still and I avoid the risk of clipping their quick. In my humble opinion, it is much better for a rabbit to stay still when I clip their nails rather than having them trying to escape my clutches which I believe is more stressful. Furthermore, I usually clip nails all by myself without the help from someone to hold my rabbits. No fuss and done in less than 2 minutes per rabbit. Another thing that people have to know is that, baby rabbits nurse with their belly facing upwards which is also the same as the trance position. And often times when mama bunny is done nursing, the kits can be seen sleeping on their backs. Again, that is trance – naturally. Mama rabbits never lie down for their kits to suckle but stand over them instead. So if lying on their backs is harmful, I could have lost many baby rabbits but in reality, I have not lost one bunny through trancing. So let your hair down and TRANCE! How do we know if a rabbit is in a trance or sleeping? My rabbit “likes(? )” to be cradled. She keeps still and doesn’t try to struggle free when I carry her like a baby. After awhile, her eyes closes and her body goes limp. Sometimes her feet or mouth will twitch a little.